Spring has finally sprung, and colorful flowers will soon be popping out of the ground! Give the fresh new season a warm welcome by making these adorable (and incredibly simple!) DIY popcorn flowers. So the popcorn balls don’t roll around as you’re covering them in chocolate, stand each popcorn ball on top of a shot glass. Place the colored chocolate wafers into a bowl and heat them in the microwave until they melt. Stir the chocolate every 30 seconds so it doesn’t burn. Using a spoon, drizzle each popcorn ball with the melted chocolate. Place the popcorn balls, along with the shot glasses, in the refrigerator for about a half hour or until the chocolate drizzle hardens. To make the flower pot and stem, fill a mason jar up with crinkled filler paper. Pack it tightly so that the flower snugly and securely stands in the jar. Cut a small, square piece of green tissue paper and pierce the lollipop stick directly in the center of the square to create the flower’s leaves. Then, poke the lollipop stick vertically directly in the center of the jar, right through the filler paper. Make sure the lollipop stick doesn’t tilt over. Finally, prettify the mason jar by tying a piece of jute twine around the mouth of the jar. After the chocolate on the popcorn balls has hardened, take the popcorn balls out of the refrigerator and remove them from the shot glasses. To make the popcorn flowers, insert the top of the lollipop stick directly into the bottom of the popcorn ball. Don’t push too far; you don’t want the ball to split in half! And there you have ’em: blossoming popcorn flowers you can use to decorate your home … or eat for dessert! Here’s a tip: If you want to make an even bigger popcorn flower arrangement for the center of your table, tightly pack a small planter with filler paper, crinkle up multiple tissue paper squares and line them along the rim of the planter to create a grassy look, like we did above. Have your own ideas on how to make DIY popcorn flowers? Share them with us! 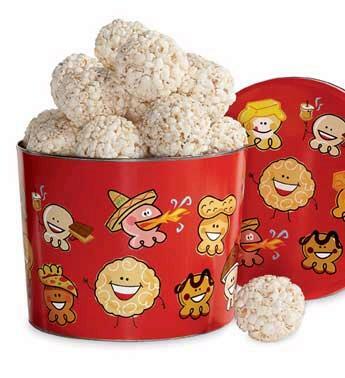 Popcorn Balls Bash – 3 popcorn prizes! The Popcorn Factory is throwing a “Popcorn Balls Bash” party right here on our Popcorn Factory Blog! ! What we love most about popcorn balls is that they bring the family together with something fun to eat and enjoy. We will be giving away 3 prizes!! The prize as you can imagine is the Popcorn Pals Popcorn Balls 🙂 We will pick the winnners at random. In about a paragraph or two, tell us about your memories with Popcorn Balls and your family through the years. As you can imagine all of us here at The Popcorn Factory are big Popcorn Ball fans, so we absolutely love to read these memories. All of us here made popcorn balls as kids – it’s on the application form 😉 – so now that we are all grown up we pour that passion and those fond memories into gifts like popcorn balls. So let’s hear that paragraph or two about memories with Popcorn Balls and your family through the years and we’ll pick 3 oh-so-lucky winners!